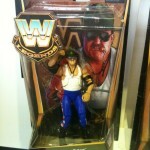 The Fwoosh got a look at the newly released The Rockers WWE Legends figures. 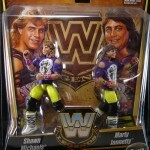 The 2-pack includes Shawn Michaels and Marty Jannetty. We’ve mirrored a few photos. They can be seen by clicking the headline of the story. Discuss on the Toyark Forums› Views: 7901 › Credit: BlackMagnus of the Toyark Forums! You can see in and out of package photos by clicking the headline of the story. 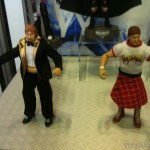 MattyCollector has revealed a set of WWE figures based on The Rockers.They have also revealed the WWE Superstar Display Stands. 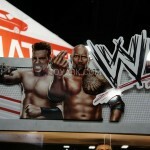 Remember back at San Diego Comic-Con when we announced that starting in 2012 the WWE® Legends line would be available exclusively at MattyCollector.com? And remember we also promised we’d be kicking things off early by reuniting fan-favorites Shawn Michaels® and Marty Jannetty™ in action figure form this fall? Well get ready, because on Monday, November 21 at 9 a.m. PT you’ll have the chance to pick up our exclusive WWE® Legends 2-pack featuring The Rockers! Shawn Michaels and Marty Jannetty were friends and tag team partners even before they hit the WWE® scene as the Rockers. In 1988, the lively duo gained instant success after several victories against the Brain Busters and Rougeau Brothers. Although they proved themselves to be worthy opponents, the Rockers never officially held the World Tag Team Championship. The duo did defeat the Hart Foundation in a World Tag Team Championship Match in 1990. Unfortunately, the top rope broke during the best-of-3 falls match, and because of that, was later declared a no-contest. The Rockers’ legendary partnership came to an abrupt end in 1992. Michaels brutally attacked Jannetty, hitting Sweet Chin Music and putting him through a window during their infamous interview on The Barber Shop. 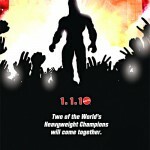 Also jumping into the ring on November 21st are our WWE® Superstar Display Stands. These fan-demanded stands have been specially designed to display your favorite WWE® 6″ figures from Mattel (works with most) and will come in a pack of 25 stands ($12 per pack). Remember, the sale starts Monday, November 21st at 9 a.m. Pacific (12 noon Eastern) right here at MattyCollector.com. Check out a photo of The Rockers by clicking the thumbnail.